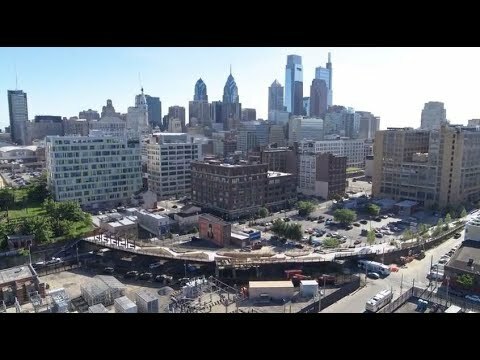 PHILADELPHIA (June 14, 2018) – City and state officials, philanthropic organizations, cultural and business leaders, neighbors and civic groups joined Center City District (CCD) President and CEO Paul R. Levy and members of the public for a ribbon cutting event to celebrate the official opening of Phase 1 of the Rail Park, a $10.8 million construction project that has transformed a blighted section of the former Reading Railroad Viaduct into an elevated park with walking paths, landscaping, lighting, swinging benches, and expansive city views. The project also included the reconstruction, landscaping and lighting of the 1300 block of Noble Street. SEPTA, owner of the spur upon which this first phase of the Rail Park is located, leased the land to the CCD for the duration of the construction work. With the completion of Phase 1, the CCD is turning it over to the City of Philadelphia, which will own the park. It will be maintained and managed in a three-way partnership of the city Department of Parks & Recreation, the Friends of the Rail Park, and the CCD. For a list of contributors to the transformation of the Rail Park, Phase I, click here. To see the Rail Park Design & Construction team, click here. Built in the 1890s to carry passenger and freight trains into Center City, the viaduct consists of steel bridge structures, elevated filled areas and arched masonry bridges running from 11th and Vine streets to 9th Street and Fairmount Avenue, with a spur at Noble Street. After the last train traveled its rails in 1984, the viaduct rapidly succumbed to weeds and disrepair. In 1995, SEPTA acquired the quarter-mile-long spur – now the Rail Park -- that curves off northwest from the main branch. The park’s design was chosen to reflect the neighborhood’s industrial roots and repurpose the historic elements of the rail structure wherever possible. A wide path through the park is edged with native canopy trees and other plantings designed to provide air quality benefits and manage storm water runoff, and interspersed with a variety of public spaces, wide platform benches, wooden bench swings and walkways. The Rail Park’s Phase 1 is a proof-of-concept that will be used to advance the next phase of the project: the undeveloped area of the viaduct to the east of the Rail Park, extending from the main branch to 9th and Fairmount. In 2010, with generous contributions from the William Penn Foundation and from Poor Richard’s Charitable Trust, the CCD commissioned a feasibility analysis of the entire viaduct from Vine Street to Fairmount Avenue. The consulting team was Urban Engineers, Cecil Baker + Partners, and Friends of the High Line, New York City. The City of Philadelphia retained Jones Lang LaSalle. The consultants jointly evaluated options that included total and partial demolition of the viaduct, as well as renovation alternatives, and assessed the potential impact of each option on real estate and community development in the area. The study concluded that renovating the viaduct was far less expensive than demolishing it (at a cost of $50 million) and that significant environmental liabilities and costs could be minimized by removing, capping and covering any contaminated soil that might still exist in the fill beneath the tracks. Further, the team concluded that based on the experience in other cities, the project was highly likely to generate new investment in the surrounding area. In 2011, based on these conclusions, and with further generous contributions from the William Penn Foundation and from Poor Richard’s Charitable Trust, the CCD commissioned schematic design and engineering by Urban Engineers and Studio Bryan Hanes. The planning, which focused on the SEPTA-owned spur only, was conducted in partnership with the Friends of the Rail Park, community stakeholders, the city’s Commerce Department and Department of Parks and Recreation. In January 2012, after neighborhood meetings the previous fall to discuss community preferences and aspirations for the viaduct, the design team presented multiple design options at a community meeting with residents, property owners, and businesses from the area. Participants strongly favored making the park an informal space with plenty of shade trees, lush native grasses, shrubs and flowering plants, and with room to walk and sit. They wanted the park to maintain the industrial authenticity of its origins, while still meeting modern safety, code, and access requirements. In March 2012, Studio Bryan Hanes and Urban Engineers, incorporating the preferences cited by community participants, presented renderings of a new public park on the SEPTA spur. The response from the community was enthusiastic, resulting in the selection of a preferred schematic design that led to the creation of the park as it is today. At the request of former Councilman Frank DiCicco, the City of Philadelphia generously funded the creation of construction documents. For more information, photos and videos of the Rail Park, visit centercityphila.org/ccd-services/streetscape/rail-park.